Two days before the midterm election, Norwegian journalists said President Trump admitted that he will lose. The day after the election, the same group of people said Mr Trump was looking sad. They also said he tweeted he was happy despite the fact that he lost seats. There is no secret that you can count Trump supporters on one finger in Norway. They are mocking him every single day. They often like to refer to CNN. The channel Mr Trump call Fake News. They are also very similar because about 98 percent is negative news. All the time. Every single day. If there are some good news, they makes it look bad. It is something fundamentally wrong when everybody is on one side. Everybody on one side means there is no balance. Ask some kids on the streets what they think about Mr Trump and I`m pretty shure they will say something negative. This is indoctrination. There is one good thing going on right now. Some people wont listen to the MSM anymore. They dont belive in it. This is why Trump and the Republicans had tremendous success in the midterm election. It also proves that the Dems` Russia story is a hoax. MSM predicted a blue wave on Tuesday, but what we saw was the 2016 election on repeat. People said yes to Mr Trump. Again. Maybe they will come up with a new Russia story, but it wouldn`t work. The Russia hoax reveals how persons within the FBI and Obamas Justice Department worked improperly to help Clinton and defeat Trump in the 2016 presidential election. We havent heard the last word in this case, and here comes the midterm election in. To those who belive that Mr Trump was a big loser on Tuesday, have a listen to this; Obama lost -63 seats in the house and -6 seats in the senate in his first midterm election. That`s -69 seats. Trump lost -27 seats in the house but gained +3 seats in the senate. That`s only -24 seats. 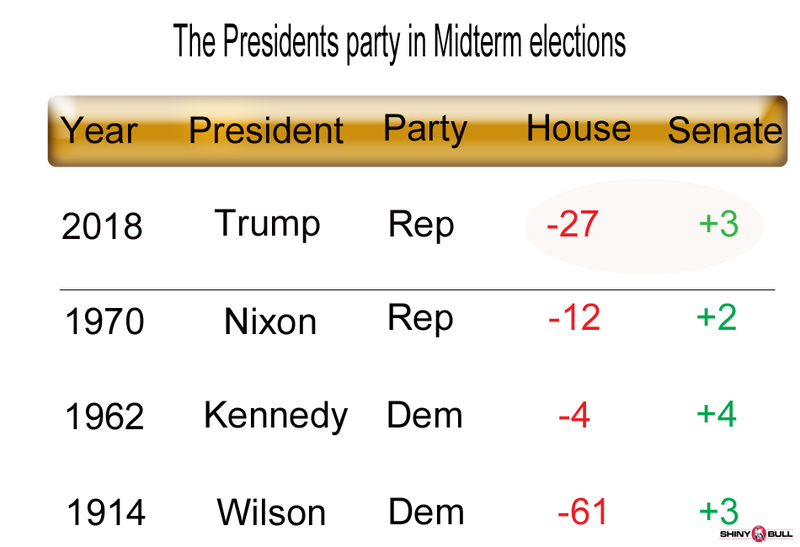 The presidents party has lost an average of 37 seats since the end of World War Two, and historically the party in the White House has lost a badly in midterms, especially when a presidents job-approval rating was below 50 percent. In other words; the 2018 midterm election was great for Donald Trump. According to Marketwatch, it`s only the third time in the past 100 years that the party holding the White House has gained seats in the Senate in a mid-term election while losing seats in the House. The same split outcome also occurred under John F. Kennedy in 1962.